Here is my first entry in Johnsonville's No Ordinary Burger Contest, that I mentioned previously. 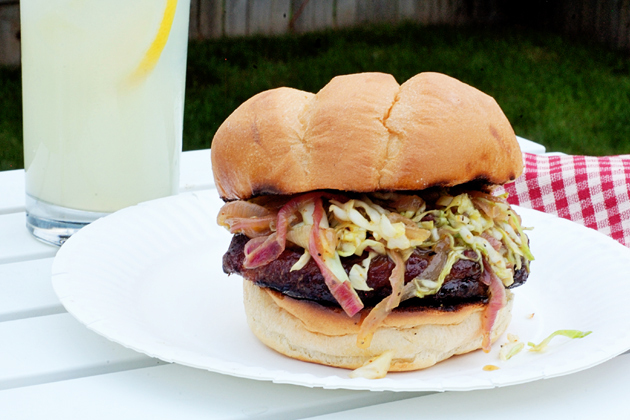 For this burger I twist up the classic traditional combination of brats, beer, onions and kraut (well kinda). The idea behind this burger is to keep things simple, but not at all ordinary. For the slaw I use reduced American-style beer as a braising liquid for sliced red onion, and also as the base for the dressing. I then add some spicy brown mustard, black pepper and shredded cabbage. The result is a nice balance of sweet, tang, and crunch with a hint of bitter that perfectly compliments the rich bratwurst. Combine the beer and salt in a large pot. Bring to a boil, stirring frequently to keep the foam from overflowing. Reduce the heat to medium-high and cook at a low boil until the beer is reduced by half. Add the onions and continue cooking, stirring occasionally, until the liquid has reduced to about a tablespoon, about 20 minutes. Remove the pan from the heat, add the mustard, sugar and pepper. Mix well until all of the ingredients are completely incorporated. Add the cabbage to the pan, stir well, cover and set aside at room temperature. Grill the bratwurst patties per the package directions. Slice each bun and lightly butter each half. Toast the buns on the grill. Serve the burgers topped with a healthy portion of the slaw. My second entry can be found here. Thanks, Ken. Please let me know what you think. These burger patties are wild and I think your topping will work great with them. Can't wait to give these bratwurst patties a try! You make food look sooo good! I may not comment very often but I'm following along and enjoy your posts immensely! Thanks Lisa, I'm happy to have you as a reader. Thanks for a great summer recipe! Will try these soon! We gave this recipe a whirl as part of our father's day bbq & it was a HIT! My 12 year old son grilled the brat burgers, while I made the slaw. Easy recipe w great results!